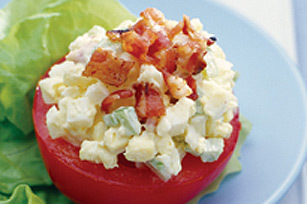 Serve a creamy egg salad topped with crisp bacon on a bed of halved tomatoes and farm-fresh lettuce for a simple starter or a light lunch - just follow the 3 simple steps in our Crispy Bacon 'n Egg Salad recipe. Mix eggs and mayo in medium bowl until well blended. Add celery and half of the bacon; mix well. Cover and refrigerate until ready to serve. Cover each of 6 salad plates with 1 lettuce leaf; top each with 1 tomato half. Spoon egg mixture evenly over tomatoes; sprinkle with remaining bacon. Serve with your favourite Christie crackers and a fresh fruit cup. Substitute chopped carrots or onions for the celery. Place eggs in saucepan. Add enough water to saucepan to completely cover eggs. Bring water to boil. Remove saucepan from heat if using electric range. If using gas range, turn off the heat. Cover pan; let eggs stand 20 min. Add eggs immediately to bowl of cold water. Let stand until completely cooled, changing water as necessary. Perfectly hard-cooked eggs will have a firm yellow centre with no greenish tinge. For a handy snack, or to make mealtime easier, cook eggs while you are in the kitchen preparing another meal. Store them, unpeeled, in the refrigerator for up to 7 days. Cut thin slice off rounded part of each tomato half before placing on salad plate to help keep tomato in place.